Nowadays people of all ages replace the good old diary with a blog, where they write about their life or a professional story. How should we go about writing a blog? what are the conventions? the style? WhiteSmoke Blog Writing Software has the answers to these questions. WhiteSmoke Blog Writing tool will guide you to writing a perfect blog. WhiteSmoke Blog Writing tool is the ultimate way to check and edit your blog, based on Natural Language Processing (NLP). WhiteSmoke will not only check grammar and spelling mistakes, but will also edit and enhance your text. Online Dictionary - WhiteSmoke Online Dictionary will provide you with the definitions and spelling of English words. Try our online blog writing tool for free today, and assess the quality for yourself. 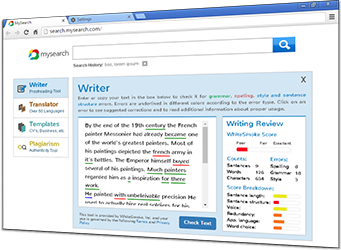 WhiteSmoke Blog Writing Tool includes an enrichment software which will make your text look more professional by choosing the correct style and vocabulary to your context. 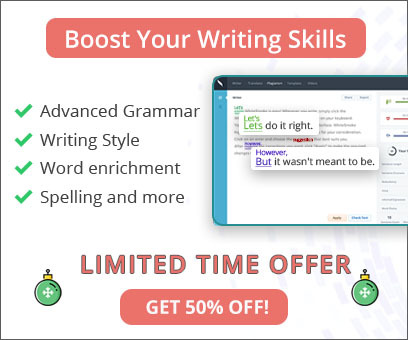 In addition, the blog writing tool includes a punctuation software, which will solve all your punctuation problems, and a grammar checker, which will solve all of your grammar problems.